Situated in West Africa, Cameroon, shaped like an elongated triangle, contains an area of 475,440 square kilometers (183,568 square miles). Comparatively, the area occupied by Cameroon is slightly larger than the state of California. There are four geographical regions: the western lowlands, which extend along the Gulf of Guinea coast; the northwestern highlands, which consist of forested volcanic mountains, including Mount Cameroon, the nation's only active volcano and the highest peak in West Africa; the central region, which extends eastward to the border with the Central African Republic; and the northern region, which is essentially a vast tropical plain that slopes down to the Chad Basin. The southern and northern regions of the country are two distinct climatic areas. In the south there are two dry seasons, December to February, and July to September. The northern part of the country has a more comfortable climate. Many staples of the Cameroonian diet came from the explorers of the New World (the Americas). 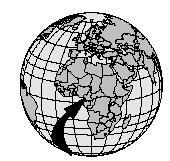 The Portuguese arrived in Cameroon in 1472 and brought with them such foods as hot peppers, maize (corn), cassava (a root vegetable), and tomatoes. Other Europeans settled on the Came-roon coast in the mid 1800s, with the British arriving first, followed by the French and Germans. The French influence is reflected in the presence of some foods, such as omelets and French bread, as well as in the preparation of some dishes; however, for the most part, Cameroonians continue to prepare their own traditional foods. Fried prunes are simmered in a savory tomato sauce and served over rice for a filling casual family dinner. the capital city, Yaounde, also offered a variety of cuisines, including Chinese, French, Italian, Russian, and traditional Cameroonian food. In the smaller cities, street vendors and restaurants serve more traditional favorites than foreign dishes. Rinse the prunes, cut them in half, and remove the pits. In a saucepan, simmer the prunes with water until soft, about 4 minutes. Drain. 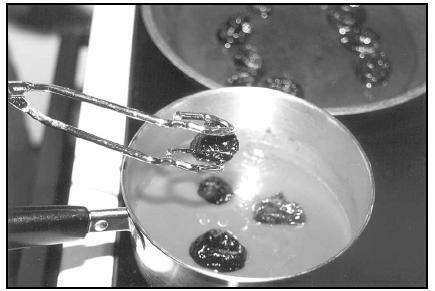 In a frying pan, heat the peanut oil over medium heat and fry the prunes, about 2 minutes. Measure the tomato sauce into a medium saucepan, and add the fried prunes. Cook over medium heat for 5 minutes. Serve over rice. The staple foods eaten by the people of Cameroon vary from region to region, depending on climate, and what is grown locally. In general, the Cameroonian diet is characterized by bland, starchy foods that are eaten with spicy (often very hot) sauces. Meat on skewers, fried and roasted fish, curries and peppery soups are common dishes. Staple foods eaten in the north are corn, millet, and peanuts. 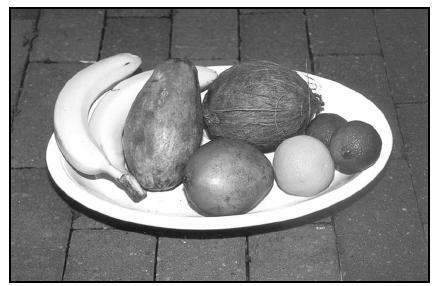 In the south, people eat more root vegetables, such as yams and cassava, as well as plantains (similar to bananas). In both north and south regions, the starchy foods are cooked, then pounded with a pestle (a hand-held tool, usually wooden) until they form a sticky mass called fufu (or foofoo), which is then formed into balls and dipped into tasty sauces. The sauces are made of ingredients such as cassava leaves, okra, and tomatoes. The food most typical in the southern region of Cameroon is ndole , which is made of boiled, shredded bitterleaf (a type of green), peanuts, and melon seeds. It is seasoned with spices and hot oil, and can be cooked with fish or meat. Bobolo , made of fermented cassava shaped in a loaf, is popular in both the south and central regions. Fresh fruit is plentiful in Cameroon. The native mangoes are especially enjoyed. Other fruits grown locally and sold in village marketplaces include oranges, papayas, bananas, pineapples, coconuts, grapefruit, and limes. This is a good recipe to make with a friend, so you can share the job of stirring the stiff mixture and holding the pot steady. Neither the ingredients nor the process is authentic, but the results are similar in texture to the fufu prepared in Cameroon from cassava. Cassavas resemble sweet potatoes, but have a shiny, brittle skin. Pictured with the cassavas here is a bag of gari (or cassava meal), which may be used to make fufu. Bring the water to a boil in a large pot. Mix the instant flour mix, instant potato flakes, and tapioca together. Add the mixture to the boiling water, about 2 cups at a time. The mixture should be thicker and stiffer than mashed potatoes. Let the mixture cool. Form the fufu into balls. Serve with a spicy stew or soup. Scrub the yams. Place them in a large pot and cover them with water. Drain yams into a colander, and run cold water over them to cool them. Remove peels from yams and return them to the pot. Shape the fufu into balls and serve with stew, sauce, or gravy. (If using any greens other than bitterleaf, skip this step.) Soak the bitterleaf overnight; drain in the morning and press out the excess water. If using kale, collards, or turnip greens, wash the greens, chop them, and cook them in a pot of boiling water for 5 minutes. If using spinach, wash the leaves and chop the spinach. Heat 2 Tablespoons of oil in a large pot and add the onions, garlic, and ginger. Sauté for 3 minutes. Add the chopped tomatoes, reduce heat, and simmer for about 3 minutes. Add the greens and simmer, stirring frequently, about 5 minutes. Add the peanut butter. Stir to combine well, cover the pot, and continue simmering until greens are tender (about 15 minutes). If mixture seems too dry, add water, ½ cup at a time. Cut shrimp into small pieces. Cook for 10 more minutes, then add the spinach. Serve with rice or boiled plantains and fufu. Fruits available in village markets include (left to right) bananas, papaya, mango (front), coconut (back), oranges (front), and limes. During the month long observance of the holiday of Ramadan, Cameroon's Muslims fast from dawn to dusk. This means they are forbidden to eat or drink during this time. The evening meal during Ramadan may include a rich soup. In most areas, a fete des mouton festival is celebrated two months after Ramadan to remember the willingness of Abraham to sacrifice a sheep from his flock. This celebration lasts for several days, during which it is customary for people to slaughter a sheep and then visit their friends and neighbors, giving them gifts of meat. Most Cameroonians celebrate Christmas, even those who are not Christian. It is a time for visiting friends and family, and exchanging gifts. Holidays and events, such as coronations; saying goodbye to someone going abroad; weddings, and even funerals, are marked by feasts and meals at which friends and neighbors gather to eat local favorite dishes. It is traditional to slaughter and cook a sheep or goat at important occasions. Chicken dishes are also popular holiday fare. Boil the coconut milk until it thickens. Set it aside to cool. Pile the bananas, tomatoes, pineapple, and avocado alternately in layers in individual glass dishes. Top with chopped peanuts and the thickened coconut milk. At mealtime, damp towels may be passed out to diners (before and after the meal), to wash their hands; Cameroonians eat out of communal bowls. Using their right hands, they dip three fingers into the starchy food—often fufu or a millet dish—and then into the stews or sauces of the meal. It is customary for the men to serve themselves first, while the women wait patiently and the children eat what is left after the adults have finished. People of Cameroon eat three meals a day. A variety of foods, including fruit, porridge, and boiled plantains, may be eaten for breakfast. Eggs and boiled cassava are also popular choices. Lunch and dinner are likely to feature a starchy dish such as fufu , boiled cassava, rice or millet, generally served with a vegetable soup or a hearty stew. Meal preparation is very time consuming. Preparation of fufu , for example, can take days. 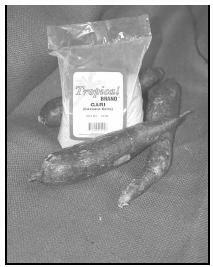 The cassava or yams must be boiled and pounded into a pulpy mass. The preparation of fufu from powdered starch or rice is less complicated, but still requires much stirring. Cooking in the villages generally takes place over wood or charcoal fires, with iron pots and wooden spoons. In towns, canisters of propane may be used to power gas stoves. Even at the beginning of the twenty-first century electricity is seldom available for cooking use except in the largest cities. Wash the cassava, then peel off the thin white and brown skins. Cut the cassava into 3- to 4-inch long pieces. Cut each piece in two and remove the midrib. Place the cassava into a pot with enough water to cover the cassava half way. Add salt. Boil until the cassava is soft, but not falling apart. Drain and serve hot with fish or meat stew. The government has tried for years to improve nutrition and health care, but there is a shortage of doctors and medical supplies, so the life expectancy is just about fifty years. Less than half the children receive immunization against common diseases such as tuberculosis, polio, and measles. Families spend about one-third of their income on food—mostly on plantains, cassava, corn, millet, and small amounts of meat. Peanuts, called groundnuts, are an important source of protein. Cusick, Heidi Haughy. Soul and Spice . San Francisco: Chronicle Books, 1995. Hudgens, Jim and Richard Trillo. The Rough Guide to West Africa . London: Rough Guides, Ltd., 1999. Iodowu, K. E. Auntie Kate's Cookery Book . Cameroon: published privately, 1976. California Academy of Sciences, Traditional Arts Program. [Online] Available http://www.calacademy.org/research/anthropology/tap/archive/1999-10--soya.html (accessed April 11, 2001). CARE. 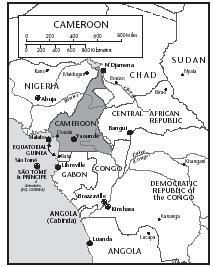 [Online] Available http://www.care.org/info_center/field_notes/cameroonft.html (accessed April 11, 2001). U.S. Peace Corps. [Online] Available http://www.peacecorps.gov/wws/water/africa/countries/cameroon/dailyusage.html (accessed April 11, 2001). University of California, Berkeley, Searchable Online Archive of Recipes. [Online] Available http://soar.Berkeley.EDU/recipes/ethnic/africa/indexall.html (accessed April 11, 2001). Welcome to Cameroon. [Online] Available http://www.telp.com/cameroon/index.htm (accessed April 11, 2001). Weekend Special, Le Magazine de Afric'Netpress. [Online] Available http://www.iccnet.cm/cam_actu/samdim/damez.htm (accessed April 16, 2001). African Food Club [Online] Available http://www.africanfoodclub.com (accessed April 19, 2001). Cassava, plantain, and other ingredients can be found in the produce section of larger grocery stores, as well as in Asian and African specialty stores in many areas of the United States. This page was very useful for me, doing my school project. Very detailed, and very helpful. Keep up that amazing job! What is Cameroon's national dish? I can't find it anywhere. Thank you. what is cameroon's national dessert? i need to know for a school project in geography!.!.!.!. Excellent description of food and cultural practices related to dining. Happy to see my country,s foods; but most of the dscription ar not good. We don,t eat very hot food. I,m from douala where the main food is (NDOLE)and will say the best ndole is without ginger. Th best ndole receipe is simple must be green. need to washe the bitterleaf to finish the bitterness before cookind your ndole.